This review is about item#8458877. Easily cut by hand It must be light and strong. Strong adhesion is also good. It is the easiest to use. I think it is better if there is a little more adhesive power. It is useful for various car maintenance tasks. I would appreciate if the price would be a little cheaper. This review is about item#8741862. As it is white, it is convenient to use it in various ways. We purchased as packing tape of Pradan to change over and over again. It is usable without a problem. There is a sense of security because it is 75mm larger than the general 50mm width. This review is about item#8741871. We always buy and are very useful. I want to buy it in the future. This review is about item#26748986. It is stopping here when packing goods with bubble wrap, but it is very good to peel off exactly and peel it neatly when peeling off. It was able to fix properly until peeled off, and it was refreshing without leaving anything when peeling off. I thought that there was only green until now, so I would like to use white from now on. This review is about item#08458877. It is much easier to use than a monster tiger's isomorphic one. It can not be helped accordingly. Although it can be cut with hands, the last warp thread remains the same as the cloth tape in many cases. Adhesion is just right. This review is about item#08741853. It is easy to cut by hand, and the adhesive strength is satisfactory. Very easy to handle. Although it was used for curing at the time of the floor, adhesion was also satisfactory and it was no problem even if peeling off. This review is about item#8741853. As a packing tape, the price is high, but the cutter is not necessary and workability is good. Although it is for curing, there are strong adhesion and no glue residue, I think that the base material is durable and suitable for packaging although it is thin and supple. 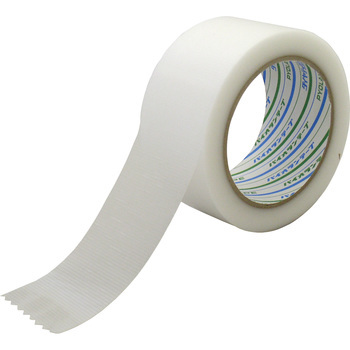 Although it is also in the review of another person, it is a good feeling tape that peels off without breaking the plastic bag or air cap though it is strong adhesive force. I do not know whether adhesiveness varies depending on the work or base material shape is appropriate, but I think that such features should be more PR. Both adhesion and size are just fine. It is handy for cutting easily with bare hands. I could use it without problems. Shipment after ordering was also quick, very helpful. Even if packaging is used, it is used to fix the content items that entered the plastic bag. This product is used because the strength of pasting is strong for curing goods. For cellophane tape etc, it can not be used since peeling plastic bag is broken, but this product is pleased with easy peeling for customers, even if it is used for storage for a relatively long term, it has sufficient strength Because it keeps, I think that there is no problem for transportation stress depending on usage. I was looking for something that was white and narrower than ordinary ones, but it was rich in kind and it was saved. There are times when it can not be cut easily by hand, there are a few knacks.